Amino AcidsSwanson AjiPure L-Phenylalanine 500mg - 60 kaps. 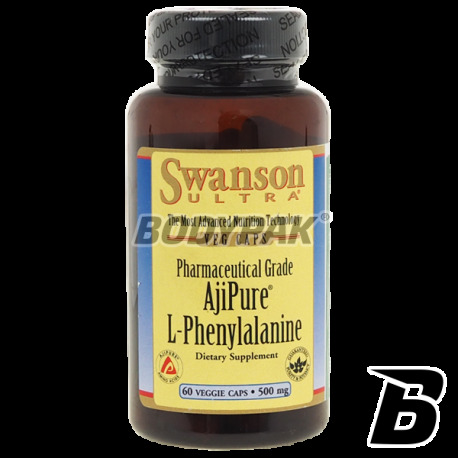 Swanson AjiPure L-Phenylalanine 500mg - 60 kaps. Phenylalanine - is one of the essential amino acids, and so the human body can no endogenous synthesis, and therefore must be supplied from the outside in the food and / or as a supplement. Phenylalanine is the precursor of another amino acid - tyrosine, as well as hormones and neurotransmitters such as adrenaline, noradrenaline and dopamine, as well as a neuromodulator - phenylethylamines. A suitable dose of phenylalanine is necessary for the proper functioning of the nervous system. Phenylalanine has the potential analgesic and antidepressant, is often in addition to the measures thermogenic effect and a stimulant, it can be found also in the concentrates of protein and amino acid preparations. Phenylalanine should be consumed in moderation, especially by people with neurological problems, because a lot of the dose may reduce the availability of tryptophan, the nerve tissue, which can lead to excessive lowering serotonin levels and such. Aggravate the symptoms of depression. Składniki: AjiPure® l -fenyloalanina, celuloza: otoczka kapsułki, mąka ryżowa, stearynian magnezu i/lub dwutlenek krzemu (substancje przeciwzbrylające).